An Amtrak worker killed himself in a Cadillac SUV after shooting his supervisor at the railroad's Sunnyside Yard in Queens and fleeing the scene Thursday, officials say. 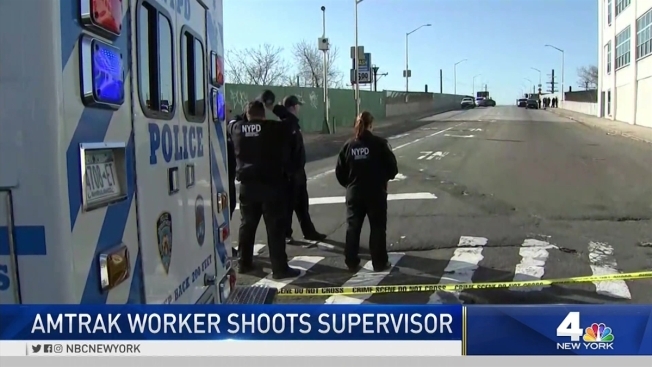 The 53-year-old victim was hospitalized in serious but stable condition after the workplace shooting around 8 a.m. Chopper 4 showed a white pickup truck cordoned off on an overpass near the yard, its driver's side window shattered. Rana Novini reports. An Amtrak worker killed himself in a Cadillac SUV after shooting his supervisor at the railroad's Sunnyside Yard in Queens and fleeing the scene Thursday, officials say. The 53-year-old victim was hospitalized in serious but stable condition after the workplace shooting around 8 a.m. Chopper 4 showed a white pickup truck cordoned off on an overpass near the yard, its driver's side window shattered. The suspect, who was 48 but whose name has not been released, fled the scene, sparking a wild manhunt before authorities found him dead in the parking lot of a Rite Aid about a mile from the initial crime scene. About 90 minutes after the shooting, Chopper 4 showed heavily armed officers with shields and tactical gear cautiously surrounding a black Cadillac in the retailer's parking lot. A man was seen removed from the SUV on a stretcher. Investigators say a gun was recovered from inside the SUV. Authorities say some sort of argument sparked the shooting, but the nature of the dispute wasn't clear. It also wasn't known how many shots were fired. Amtrak confirmed the basic details of the shooting in a statement and said the NYPD had secured the area. Train service was not affected.